The Nexus Caddy is an all-in-one cart that provides storage, a presentation space, and transportation for up to six Nexus Markerboard Tablets. Great for teachers who move between classrooms, or for offices with multiple conference rooms, the Nexus Caddy doubles as a presentation easel, offering the ability to present a variety of ideas at the same time. Durable and environmentally friendly, the Nexus Caddy contains no materials that are harmful to the environment. It features four locking casters for mobility and stability. An angled foot design also allows it to be grouped with other Nexus products to create a large, angled presentation and collaboration space. 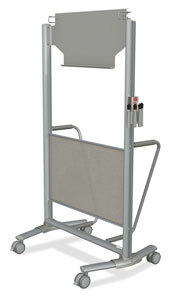 The Nexus Caddy measures 56¾"H × 32½"W × 25¼"D (144 cm × 83 cm × 64 cm) and weighs 25 lb (11 kg). It includes a 10-year manufacturer's warranty. The decorative mesh accent panel is available in four colors, including Carbon, Emerald, Pacific, and Sand. Nexus Markerboard Tablets are available separately.